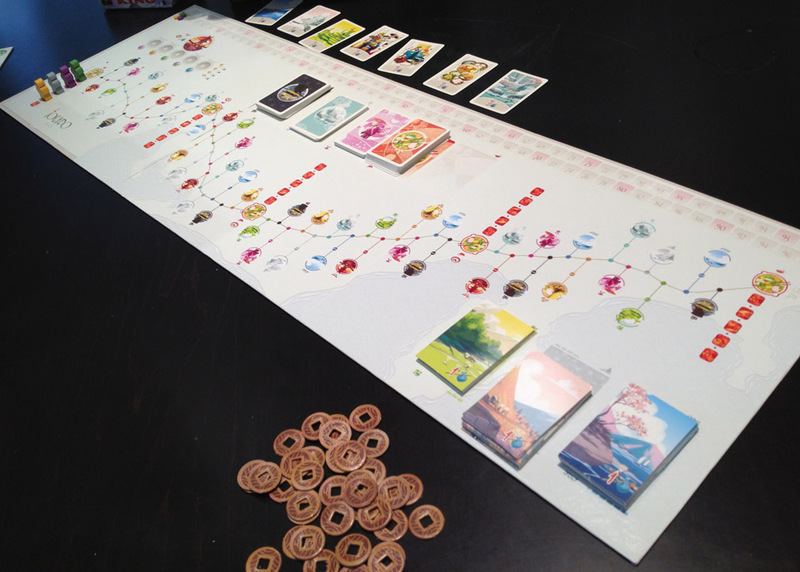 In Tokaido, players are travelling along a road visiting villages, seeing great vistas, visiting temples, staying at inns,etc. in order to earn victory points (VPs). The player with the most VPs at the end of the game wins. Players move along the road from left to right. On their turn, they can go to any empty space ahead of them (up to the next inn where they must wait for any other travelers to catch-up). Spaces at each location are limited (usually one or two spaces) so a player may not be able to visit a location if it is currently full of other travelers. This is very important because a player can never move backwards along the road.